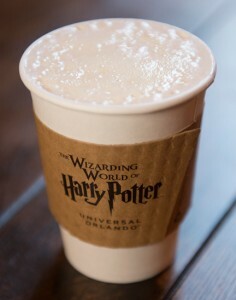 Do you love to cool off with an ice cold or frozen Butterbeer on a hot Orlando day? This Wizarding World exclusive beverage has been a favorite of Universal Orlando visitors since the Wizarding World of Harry Potter first opened. Now that the weather is cooler for the Winter, you can also get a hot Butterbeer to warm up! This delicious version of Butterbeer has the same alluring flavors of butterscotch and shortbread as the cold and frozen varieties. But the top-secret recipe has been fine-tuned just the right way to make it perfect as a hot treat. Hot Butterbeer is currently available in both the Hogsmeade and Diagon Alley sections of the Wizarding World of Harry Potter. Go ahead and give a Hot Butterbeer a try during your next visit to the Wizarding World of Harry Potter at Universal Orlando. Do you prefer your Butterbeer Hot, Cold or Frozen? Let us know below in the Comments! You can also try to make hot Butterbeer at home, too! Watch the video (https://youtu.be/7lCHFnbQTH0), below to get some ideas.